Saying goodbye can be a hard thing. It is really a tough thing, seeing someone close go away. Not only you, but the one who is going away feels sad too. 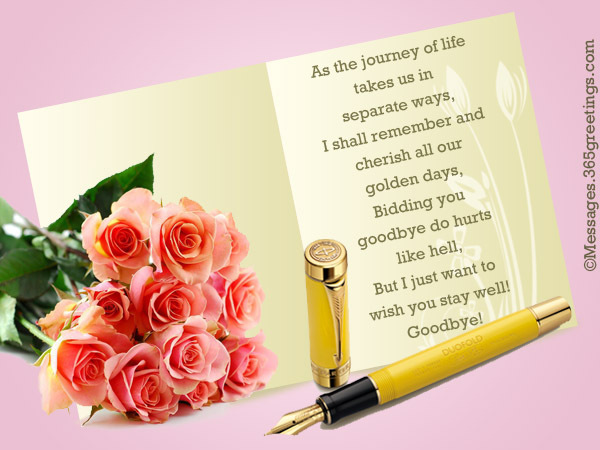 Bidding goodbye with a nice and sweet heartwarming goodbye message can brighten the mood of the one who is going. Are you looking for some unique and heartwarming goodbye messages? 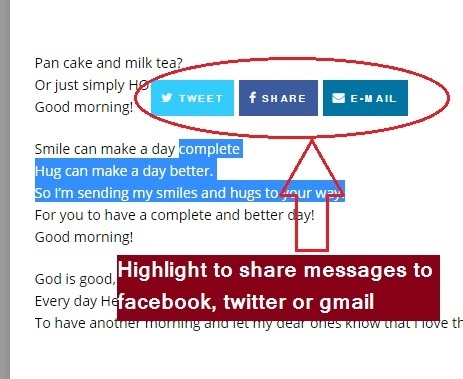 Are you fed up of repetitive and common goodbye messages that are available on web? If you answer is yes, then this section is a solution to your problem.In this post, you are going to explore the best goodbye messages. These messages will provide the perfect words to you to bid goodbye. You can send these messages to anyone in your social or professional circle. In this section, you will read some of the best and unique goodbye text messages. You can send these text messages via SMS or via any instant messenger on your phone. that’s why they call it ‘GOOD’ bye. I wish you a goodbye. You may never know when the last goodbye is! Hope this is not our last GoodBye!! and hope to see you soon… Again!! Hope you succeed in all your steps and fly high! Friends live in hearts and never say goodbye. And our bond would have grown much deeper. This is a fun section where you are going to read the most hilarious and funny goodbye messages for your friends and family. 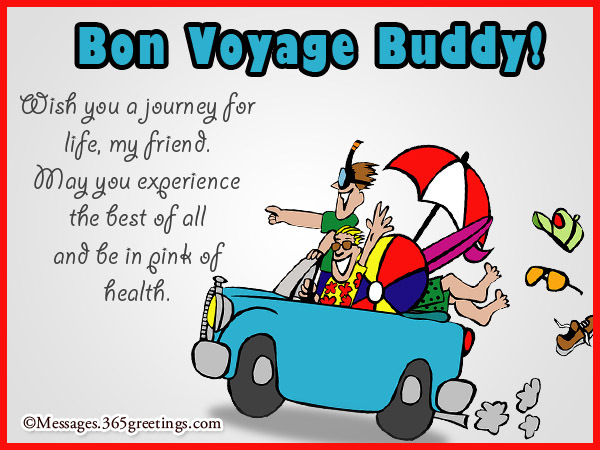 These funny goodbye messages will tickle the funny bone of your friend at the time of their departure. And bidding adieus to someone with laughter and joy is really a nice thing after all!! God save your new buddies! Will miss you badly dear friend. I will miss your sweet little ‘Hello’! So, you have decided to gift a goodbye card to your close one, who is going far away from you! That is really a nice idea. As a simple greeting card can be treasured for years and years, and that greeting card will always remind of you and the memories that are attached with you. 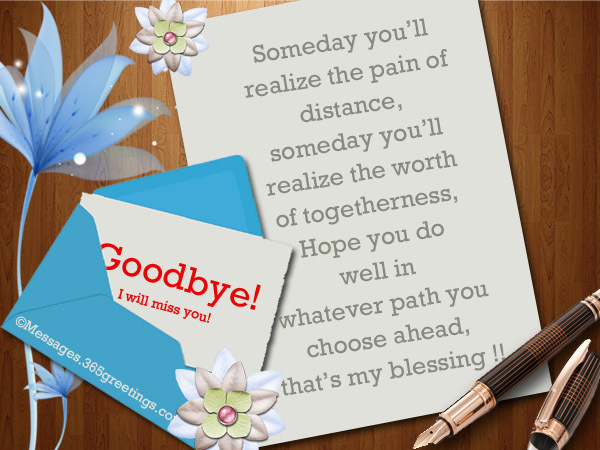 Make your simple goodbye card more beautiful with these heartwarming goodbye card messages. You can jot down these messages in a card in order to express your feelings and wish them good luck for their journey ahead. It’s time for the last class. It’s time for last lecture. as we bid each other goodbye. in our hearts forever when they depart. of so worth in my life. the goodbyes are much more painful. You’re gonna be missed a lot. I wish you success in ton. Wishing you a healthy goodbye!! but a promise made to meet again soon. Colleagues are special in their own ways. They are with us through our working hours and see us growing and making progress! Colleagues are the ones who can make our work-place a fun-place and our work environment friendly. 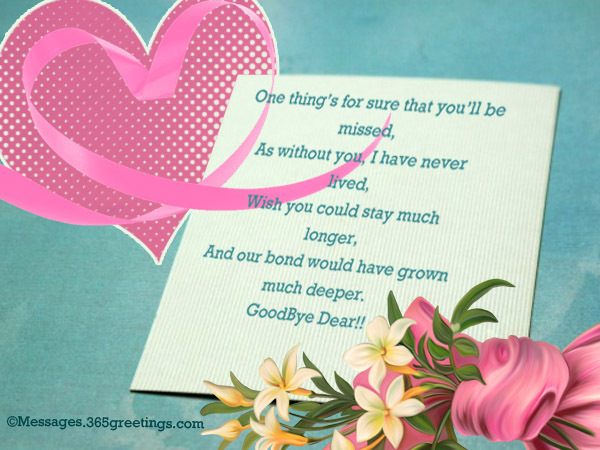 Therefore, if you colleague is going away for sometime or is shifting somewhere else permanently, you should bid him/her goodbye with a sweet and memorable goodbye message. In this section, we have some really heart-touching goodbye messages for colleagues. Go on, read and share with your colleagues. Goodbyes also bring new hellos. and embrace the new beginning. the fact that you spread your awesomeness. They also have a tinge of sharing and caring. in our life that matter more. the truths in our lives. because they are the ones who actually care. and never out of sight. bid them a heartwarming farewell. step into new phase of life. hello again awaits in future. Distance cannot separate us even if it is between two cities. and you may shine like the same in your new workplace too. that all good things always come to an end in life. We will dearly miss you here. supportive and motivating the entire team. as you have deeply touched everyone here with your work and nature. and guided on both personal and professional lives. leader and cheerful person whom everyone admired. All the best in life and May god bless you. in my life by being such good lads. Not always a sad goodbye messages is needed. You should always wish good luck to one who is going. This will provide strength and joy to the departing traveler. In this section, you are going to read the best Goodbye good luck messages. These messages are suitable for everyone in your social, professional or personal circle. Have a wonderful life ahead. Hope you find the right directions towards your dreams. and lets cherish those memories. it’s the flashbacks that hurt. and who are always remembered in good faith. I’ll miss out the great times we had together. Adiós Buddy and Good Luck! will always go with me forever. for all bitterness must be left behind. we are going to forget you. Every goodbye brings next hello nearer. Goodbye’s good luck for the future. Friends hold a special place in heart. It is really hard to say goodbye to them. But nothing is in our hands, when a friend has to go to another place. After all studies, career, family and work are things that sometimes demands relocation. And it is unavoidable. Bidding happy goodbye to friends can make them feel happy and joyful at the time of their departure. This is the last but the most special section of this post for the most special people in our lives called friends. 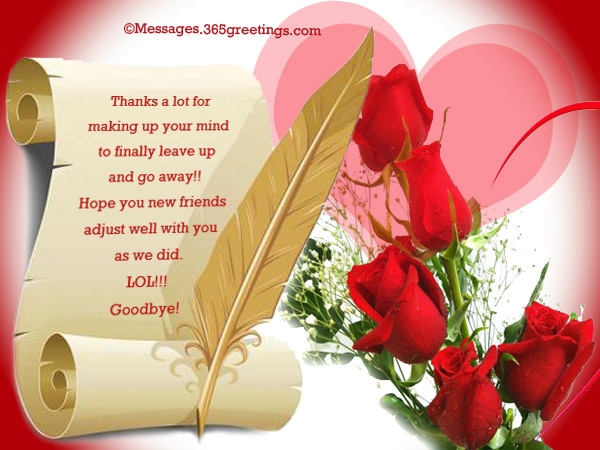 Do share these goodbye messages with your friends to wish them goodbye and bid adieus! trying to ignore you here. LOL! for the one who’s going away miles. March ahead as life’s full of surprises so vast. feel they are going to miss you. For there are going to be memories only hereafter. I will really miss you. Goodbye. they always say, ’See you soon’. There can never be a good time to say goodbye. as there won’t be you to be a leader in it. miss someone in office so much until I met you. You were a great colleague and true mentor. remains the same in our hearts forever. You were one of the best recruits we ever had. I would be very thankful to the HR who recruited you. one of the best professional experiences I ever had. You were the most apt Mr. dependable. Farewell and be in touch. helped the team come all along this way with no hitches. Farewell to you and cheers to life. the way seems like hazy in our future endeavours. but a hearty wish for your bright future ahead. who has been more of a friend than a co-worker. 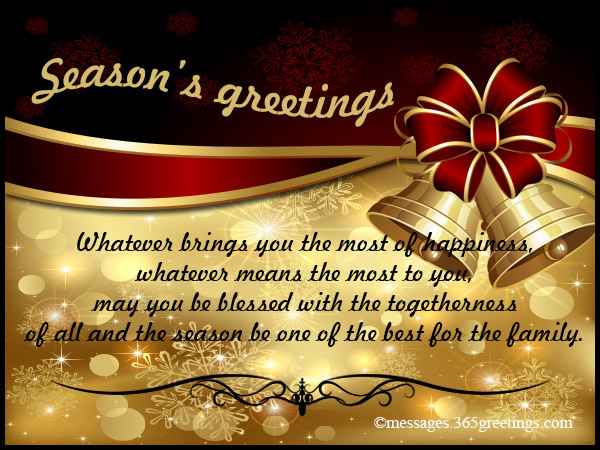 May you succeed in all phases of life ahead. Without you, the drinks after work will become sober and quiet. and colleague but also my greatest inspiration. Your morning wishes make me feel alive everyday. even if you are not here from tomorrow. Farewell to a teammate who made every day seem like a treat. These were our best creations. We work really hard in creating beautiful messages and greetings like these, so that it can help you in expressing your feelings in a much better way. 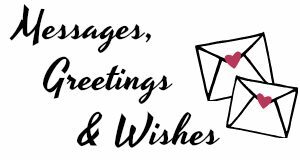 Hope you liked these wonderful messages and wishes. 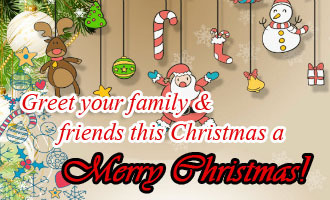 Feel free to share it with your near and dear ones… And stay connected with us for more amazing and heartwarming messages, wishes and quotes.